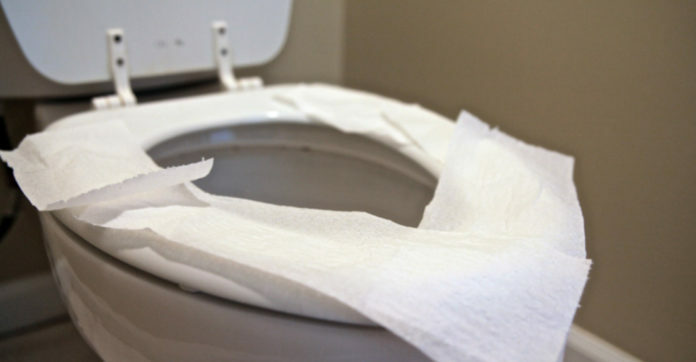 Contrary to popular belief, if you tear off a bunch of toilet paper and lay the sheets down on the seat to form a protective layer against bacteria, you're actually exposing your body to even more germs and bacteria! In fact, you're better off not putting anything down on the seat at all, whether it be toilet paper, or one of those handy paper seat covers found in many bathroom stalls. Most people assume that toilets are covered in bacteria, but the actual seats themselves are deliberately designed with curve and smooth surface, to prevent bacteria from sticking around. Germs can not multiply on bare skin alone, so don't expect to get sick from sitting on a dry public toilet seat. Our skin provides a natural barrier that protects us from micro-organisms, and besides that, much of the bacteria found on seats are already present in our bodies. In addition, studies have found that the average public toilet seat is cleaner than most people's kitchen sinks, cutting boards, and dish sponges! If that doesn't put it all into perspective, nothing else will. However, unlike toilet seats, nothing else in a bathroom stall is designed to prevent bacteria from sticking to it. Germs get spread all around the stall when we flush the toilet. They latch onto the walls, the door handle, the toilet paper dispenser, and the actual toilet paper. Unfortunately, toilet paper's surface is perfect for collecting bacteria, which we tend to have no reservations about putting on our bodies, often using it to blow our noses or wipe our faces. By doing so, we make it awfully easy for these nasty germs to get into our bodies. The best thing you can do to avoid germs and bacteria is to wash your hands thoroughly, running them under hot or warm water, lathering up with soap, and rubbing them together for at least 20 seconds. Avoid electric hand dryers, all they do is blow germs on your hands. Opt for paper towels instead if they're available, and think about investing in carrying your own baby wipes or hand sanitizer. Also, try not to touch the door or handle when exiting. If it's a push door use your hip, foot, or some other covered body part to open it. As the video below explains, hovering is the best way to go about using a public toilet; it's much cleaner and more effective than using a toilet paper barrier, and you get a mini-workout in the process. You also get to keep your peace of mind, so squatting is the way to go!